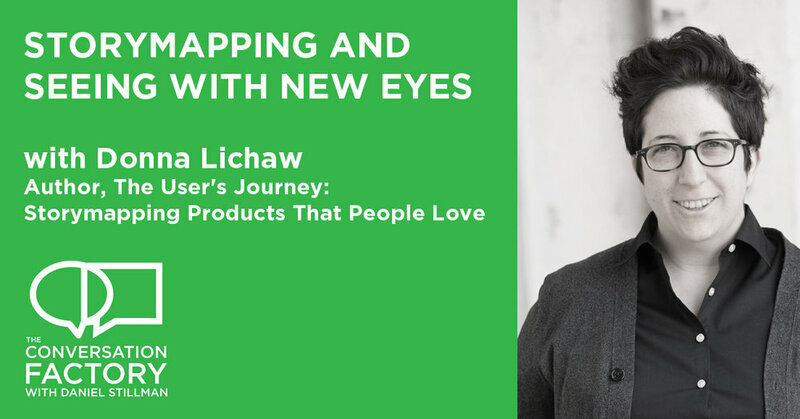 Today I talk with Donna Lichaw, a UX strategist, coach, teacher and author of The User's Journey: Storymapping Products That People Love. What's awesome about Donn'a approach to storytelling is that it's practical. There are a lot of frameworks for storytelling: The Hero's journey, Aristotle's 2 or 3-ish act structure, the rising and falling action of "Freytag's pyramid". It really doesn't matter which framework you use...in the end, when you see things as story, story becomes a doorway into a new way of working. Story becomes a material you can shape by design. For me, I've started to see conversation in the same way: a material that can be shaped to create better experiences for people. Donna and I talk about story*telling* vs story*making* and story*doing*. Storymaking is not the act of enrapturing a group of people around a campfire or at a podium, in a meeting...it's knowing how you want people to feel about an experience after it's over, what you want them to remember, to walk away with, to talk about. Storymaking isn't about manipulation, it's about intent, in this mindset. When you see experiences as a rising and falling arc, you want to make that arc smooth and incredible. You want to shape it well, with no jerks, gaps or cliffhangers...at least not unintentionally! Designing with Story in mind and designing with Conversation in mind seem to me to be two sides of the same coin. You want the person experiencing your story to respond in some way. And the next story you guide them through continues that dialogue until...? I don't know. The next chapter? Every Story has a hero, and we want to root for that hero, to see her win the day. In a great conversation you try to make the other person the hero, not you....it's the empathy with the other person and their needs and goals that makes story a powerful tool in great conversation design. 3 act structure: What did Aristotle Say about that?